With the unseasonably warm weather, it is the perfect time to do Milledgeville’s famous walking tour. On this self-guided walk, bike or drive through our town, you will be overwhelmed with the beauty of Milledgeville’s antebellum houses and history-filled stories. Here are some of the highlights of our walking tour. As the oldest church structure in Milledgeville, St. Stephen’s is a gorgeous and historical location that is beloved by locals. 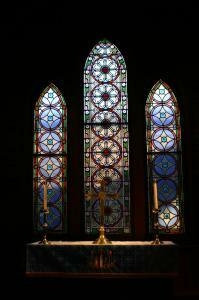 Located next to the Old State Capitol, it holds three beautiful stained glass windows that were gifted from Christ Church in Savannah as a thank you for the hospitality shown during the Civil War. It was built in 1841, however the original roof was blown off by Sherman’s Troops in the March to the Sea. 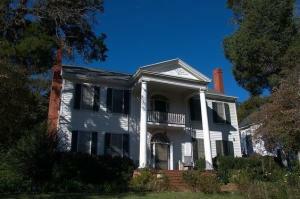 Known as one of the most beautiful houses in Milledgeville, the Orme Salle House was built in 1822 by Daniel Pratt, who went on to become one of the wealthiest men in Alabama. One of the most interesting stories behind this home happened during Sherman’s march, when Mrs. Orme hid her son-in-law, a confederate soldier, in the attic of this house to protect him from Union soldiers. 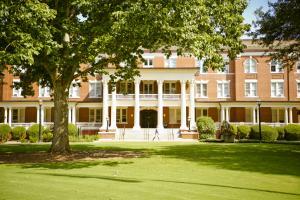 Built in 1896, this is the oldest building on the Georgia College campus next to the Old Governor’s Mansion. Saved from the wrecking ball in the mid-seventies, Atkinson Hall now hold the college of business. The man that Atkinson was named after, William Y. Atkinson, introduced the bill that created the Georgia Normal & Industrial College. 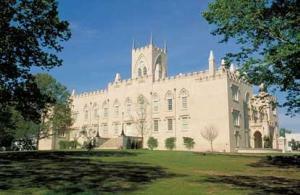 It remained a women’s college until 1967. On the Walking Tour, this stop will also show you the beautiful front campus of Georgia College, and several other important campus buildings. As one of Milledgeville’s most famous and sought-after attractions, you can’t miss this enormous pink mansion while walking along Clarke St. 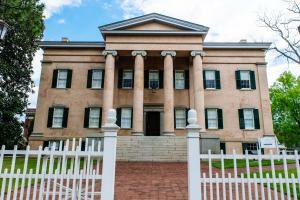 Built in 1839, the mansion was specifically designed to house the Governor of Milledgeville, which was the state capitol at the time. Since then it held many prominent leaders, including General Sherman during his March to the Sea. 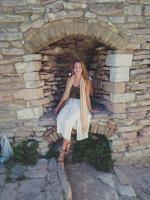 It is now a museum that holds tours from Tues. to Sat. from 10 a.m. to 4 p.m. and Sunday from 2 to 4 p.m. This home in Milledgeville is best know as “the house on the move.” It was originally owned by the same family for over 100 years, and was donated to the Old Capitol Historical Society in 1966 and was moved to its original location on Wilkinson St. 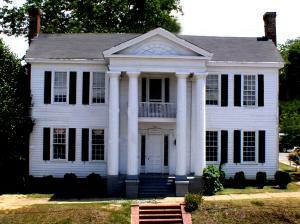 The 50th Anniversary of this historic home built in 1825 was celebrated last year by many Milledgevillians. Built in 1830 as a wedding gift to John Marlor’s second wife, this home now holds part of the Allied Arts offices. It is located in an area that was once known as “The Strip,” where many African Americans lived and owned businesses in the past. 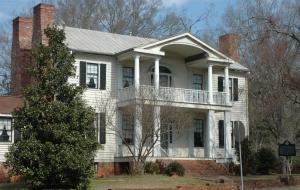 John Marlor was a popular architect in Milledgeville and also built several other houses in the area. The home now is a popular art center in Milledgeville that has exhibits and classes. One of Milledgeville’s most fascinating facts is that it was the only city designed to be built specifically to be a capitol, besides Washington D.C. In 1805, $60,000 was appropriated to build a capitol building and this building was the first example of Gothic architecture in a public building. With its beautiful arches at the entrance, tall marble walls and castle-like appearance, the Old State Capitol will be a favorite location on your tour and is now home to Georgia Military College. 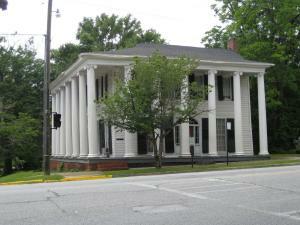 This house is a stand-out house in Milledgeville due to its towering 13 columns that line the from of the home and represent the 13 colonies of the United States. Nicknamed the “Thirteen Columns,” this home used to be a prominent hotel, where women had to enter at one side, and men the other. It was built in 1825, and is known for the asymmetrical design of a normally symmetrical architectural style.